The Duwamish River’s health and future are at a critical moment. On February 28, 2013 the EPA released its proposed cleanup plan for the Duwamish River. We only have 48 days left to provide our comments, input and concerns regarding how WE want our river cleaned up. The comment period closes on June 13. This will be our one and only opportunity to ensure a cleanup that is environmentally just and provides "a river for all": you, residents of the area, Tribal and subsistence fishermen, fish, wildlife, business and industry. All of us, and our Puget Sound, will be affected by how well we clean up the river. 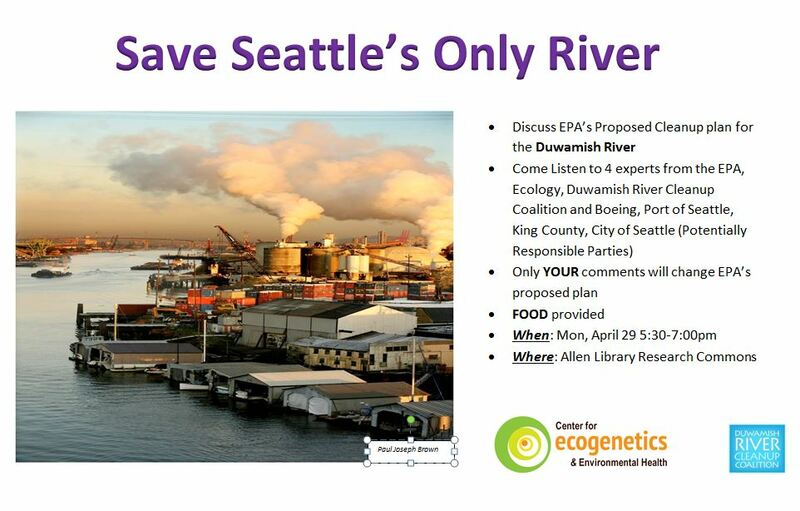 Come listen to 4 experts from the EPA, Ecology, Duwamish River Cleanup Coalition, and also from the potentially responsible parties such as Boeing, Port of Seattle, King County, and the City of Seattle. Following the event, everyone will have a chance to submit comments and make a difference to the Duwamish River: A River for All.